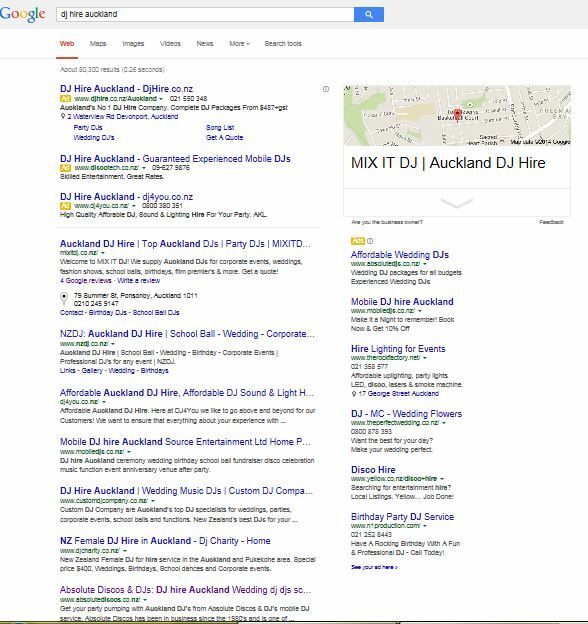 Google seems to be testing Local Marketing in NZ with more changes. Not only have we all gone through local marketing algorithm changes very recently that has rejigged all the rankings but I noticed other changed that won’t appeal to marketers. Verify your Google Listing. Firstly there is absolute confusion globally about Google’s request to verify Google + Local listings. Some say it is only applying to Australia. Others say it applies to USA. Others are suggesting it is a global requirement. Basically -no verification and your listing disappears! Is that why this listing for Absolute Discos has been relegated to the middle of the page? It had held spots #1 to #3 consistently for all its keywords, through all the most stringent of Google algorithm changes, since 2003 until recently. Google Maps Displaying a Single Result. Secondly Google Maps are only displaying a single result. Where are the multiple markers we are used to? Downunder we’ve been on holiday since Christmas and returned in February. Blink and Google changes! Or have I just missed the old news? New Ad Format. Notice is the New Ad Format. The colour has gone! The ads are each labelled with ‘Ad’. On occasions Google and YouTube make changes then revert to its status quo.